There’s a channel on satellite radio, called Escape. I’m not sure what genre of music this would be considered, but I find it very soothing. I wouldn’t classify it exactly as ‘muzak’ though. I’d describe it as very Stepford Wives meets 70’s dentist’s waiting room. It might even be considered Lawrence Welk-esque, but since I haven’t seen the show since the 70’s, I’m not really sure. I remember falling in love with the sound, back around the mid 90’s, when I would buy old, used records at thrift stores and used book stores. I bought them for the covers and eventually ended up actually listening to them and liking what I heard. 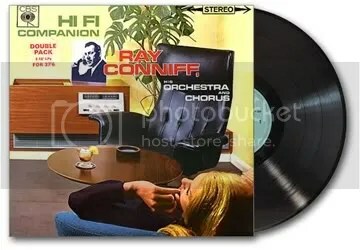 I learned to love the likes of Henry Mancini, Ray Conniff and Jackie Gleason and His Orchestra. All I know is that all the covers are very great, very Hi-Fi-licious and definitely the end of an era. Anyhoo, I find it interesting how different styles of music affect your mood. All I know is that I’m thankful for the ‘Escape‘ channel because it helped make an otherwise miserable Tuesday a lot better. This last one is HORRIBLE quality (it’s very hard to find the vocal version of Charade), but at least you get an idea of the SOUND I’m trying to describe. It’s the only precise example I could find. I see what you mean about the Stepford Wives. It makes me think of the 60’s, before the “sexual revolution”. It is very soothing music!